In the past the only way I cook lotus root is making black bean, lotus root & spareribs soup. So I am glad to find a new way to enjoy this root vegetable. This is yet another recipe I learned from my neighbor Auntie Wang. The key is to choose young fresh lotus roots (they are lighter in weigh than those you use for soup) that have clean holes– when you see the sides of lotus root, the holes should be free of mud and flesh is whitish in color. Don’t buy the processed/bleached lotus roots that come in a can or vacuum pack. The flavor of this dish is sweet, sour and also spicy at the same time. The texture of the ingredients are all crunchy to the taste. For those can’t take the heat, skip hot peppers and make the dish into sweet and sour version (I made some non-spicy lotus root for Ethan)– it’s just as good. This is a very appetizing side dish, and especially good on hot summer days as it is served as a cold dish. Prepare lotus roots: Cut off both ends and peel off the skin. Thinly slice. Then rinse a few times with water. Transfer lotus root to a pot filled with boiling water, let it boil on high heat for 5 minutes. Drain and set aside. 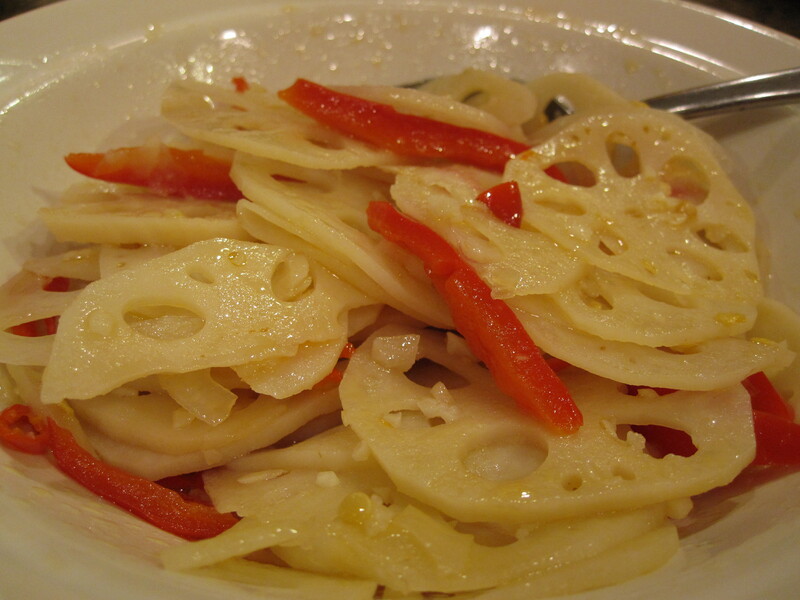 According to Auntie Wang, rinsing and boiling lotus root will prevent it from getting dark. Clean, remove seed and stem of bell pepper. Cut into strips. For celery, clean and remove any fiber on the stem, cut into strips. Then blanch in boiling water, drain and set aside. When the wok is hot and ready, add little oil and quick saute celery. Dish out. Repeat with bell pepper and dish out. Add little more oil to the hot wok, saute garlic and pepper until aromatic. Add lotus roots and seasoning to taste (there should be a little liquid in the wok from rice vinegar). Return bell pepper and celery to the wok, stir quickly and dish out. (Note: The 1st time I used my iron wok to saute lotus root, I guess the acid from the vinegar react with the meta and so my lotus root turns blueish in color after cooking. The 2nd time I use Corning cookware (as I don’t have non-stick pan in my house) to saute lotus root and it turned out perfect– of course non-stick pan is okay too). For sweet & sour version, omit hot peppers. This is a cold dish but you can eat it hot or room temperature. Any extras should be kept in the fridge and would last about 1-2 weeks.